For great prices, financing, installations, repair and service, call Robison today. Why wait days—or even weeks—to get your power restored when you can have it back in about 10 seconds? That’s how quickly the Generac residential generator will restore power. 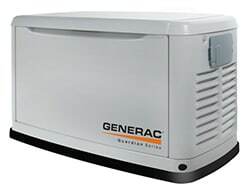 Available in a range of kilowatt output capacities to meet your home’s energy requirements, this natural gas or propane-powered generator features an automatic transfer switch that starts up the generator when a power outage occurs–regardless of whether you are home or away! With Robison as your contractor, we take care of it all for you; we’ll meet with you to determine the correct size generator for your needs, we’ll handle all the permits and arrange to have a licensed electrician complete all of the electrical connections. We’ll be there for you after the installation too. The service team at Robison maintains and repairs generators to guarantee you years of peace of mind and comfort in your home—regardless of when the next big storm hits our area. To learn more about powering your home with a generator, please contact us today. Robison, serving Elmsford, Greenburgh, Mount Pleasant, Mount Vernon, New Rochelle, White Plains, Yonkers and surrounding towns in all of Westchester and Putnam counties, NY.